How long does it take to transport a 15-story long space shuttle fuel tank through Los Angeles? According to the trip one took yesterday, around 19 hours. 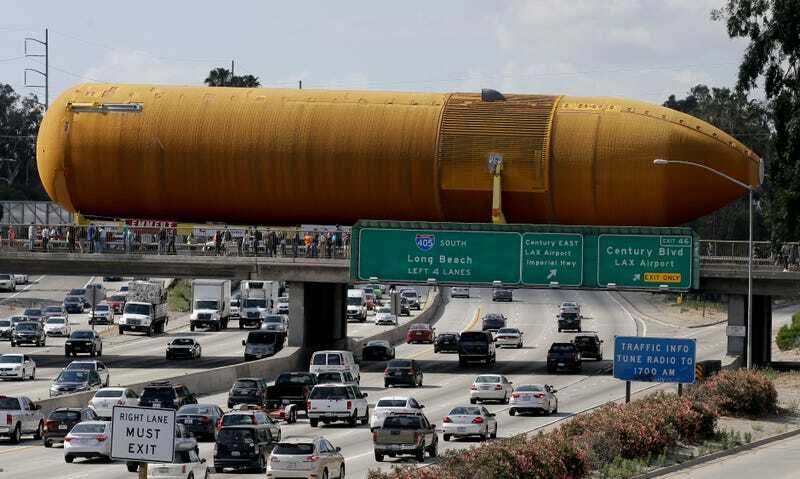 The mission: To move ET-94, “the last flight-qualified external tank in existence,” to the California Science Center from Marina del Rey, where it had arrived by barge from the NASA center in New Orleans. The tank traveled 4,400 miles and passed through the Panama Canal on its one-month journey. The total trek through the city was only 16.5 miles long, but the streets of LA are not known for being friendly to small cars, let alone a 65,000-pound fuel tank. According to the Associated Press, the tank traveled by truck starting at around midnight. It moved through the city at a blistering clip of 5 mph. The tank was escorted by police, city officials, and astronauts. Along the way, utility crews removed obstacles like telephone lines so that the tank could squeeze through narrow city streets, and would reinstall them afterward, according to the Los Angeles Times. ET-94 was originally designed to hold fuel for the space shuttle Columbia’s launch, but it was never put into use, although, it was used to study what could’ve caused the shuttle to be destroyed upon re-entry in 2003. Fuel tanks, which carry propellants, detach about 70 miles above the Earth’s surface after liftoff and often burn up in the atmosphere on their way down, so it’s no surprise that this ET-94 is the last in existence. As you can see from photos, the piece of aerospace history was welcomed by many residents, who captured images of the thing on its journey. The tank will be on display at the center, and, along with an orbiter and solid rocket boosters, will be the only place in the world where people can see a full shuttle stack, according to the California Science Center’s website.